As you might have guessed by now I’m using this year’s round of Crime Fiction Alphabet to both tell you about books I like and get you to give me recommendations for new books to read that feature themes or character types that I enjoy (for when I finally get my TBR mountain under control) (in a couple of years). That goes double for this week, I love crime fiction that features science of the vaguely credible variety or scientists that aren’t mad and I haven’t found nearly enough of them. Though I have collected a few favourites. Officially it’s probably more of a thriller than it is crime fiction but I’m prepared to bend the rules for Martin Woodhouse‘s Tree Frog (1966). The first of five novels featuring scientist Giles Yeoman who is an aeronautical engineer working, very reluctantly, for the British Government’s Seeker Section and it opens with the crash in England of an un-piloted plane that appears to have originated in East Germany. 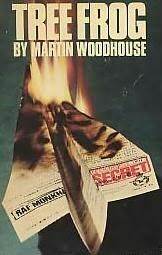 In some ways this is a typical cold war thriller in which the race is on to perfect long-range reconnaissance aircraft but Yeoman’s deadpan dialogue and reliance on his scientific knowledge and skills to get him out of tight spots is a refreshing change from the more violent spy-thrillers of Woodhouse’s contemporaries. I will admit though it’s been a long time since I read this book and I wonder if it might have dated (as happened with Michael Crichton’s The Andromeda Strain which I used to love for similarly science-y reasons but was disappointed by on a recent re-read). Randy Wayne White has a long-running series featuring a Florida-based marine biologist Marion (Doc) Ford, who was once an intelligence agent for the US government. 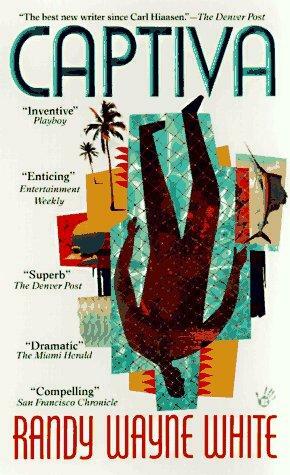 In his fourth outing, 1996’s Captiva, Doc Ford is called upon by his best mate (a burned-out hippie) to investigate the death (via a bombing) of a friend of his. The story revolves around a clearly contentious (and real) fight between sports and commercial fishermen and whether or not net-fishing should be allowed. There’s more science and thoughtfulness in the ensuing ecological and economic debate than you might expect from this kind of thriller. The series can be a little more ‘blokey’ (a few more explosions, car chases and violent outbursts) than I might normally enjoy but the characters are multi-dimensional and the science is generally pretty solid. Alex Brett is a Canadian writer who has (as far as I know) only written two mysteries both featuring Morgan O’Brien who is an investigator of scientific frauds working for the Canadian government. 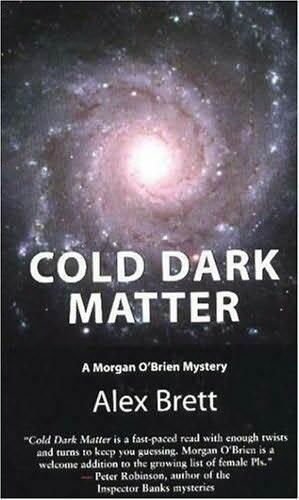 In the second of the two books, Cold Dark Matter (2006), Morgan is called upon to collect the research diaries of an astronomer who apparently committed suicide while working in Hawaii. Her questioning of the suicide, and the unexpected competition she encounters for the research data of the astronomer, leads Morgan to uncover some of her own government’s well-kept secrets from the cold war era. It really is a fascinating novel and the scientific issues in it (and its predecessor Dark Water Creek which will teach you amazing things about salmon fishing) are explored intelligently and entertainingly. It’s a shame that Alex Brett appears not to be writing any longer. As you can see I’m a bit light on for scientific mysteries so do let me know if you have a good recommendation (I’m ignoring medical doctors and forensic specialists for this category). Kerrie at Mysteries in Paradise is hosting the crime fiction alphabet meme which requires the posting of an article relating to the letter of the week. Do join in the fun by reading the posts and/or contributing one of your own. You don’t have to write every week. This entry was posted in Alex Brett, Crime Fiction Alphabet, Martin Woodhouse, Randy Wayne White. Bookmark the permalink. Have you read Liz Rigbey´s “Total Eclipse” about a British astronomer? Strongly recommended by Maxine which it deserves, but it may be difficult for you to find a copy as it is from 1995. Yes, Total Eclipse is a wow book, and if you can get hold of a copy I do recommend it. It is set in California and most of the characters are American (and, apart from the protag, women). Miss Smilla’s Feeling for Snow by Peter Hoeg, Miss Smilla is scientific throughout in fascinating ways, but the acutal “scientific denouement” is bonkers. Intuition by Allegra Goodman. Not billed as a crime novel but it could just as well be. Highly readable, authentic, exciting and rewarding. Just reading: Dinosaur Feather by Sissel-Jo Gazan. Not got very into it yet but it is about a PhD student working on the evolution of birds/dinosaurs. One of her supervisors has just been murdered. Out in the UK next month (Quercus). The Joe Pickett books by C J Box are not primarily about science but often have science central to the plot, eg methane mining technology or microbiology fuels (Free Fire). And there’s lots of environmental science/natural history in them too. Michael Crichton wrote many thrillers with different scientific themes which plummeted in quality with his ascent to bestsellerdom. The better ones are the early ones like Jurassic Park and The Andromeda Strain. There is also an author (or pair of authors) recommended by Margot who wrote science thrillers a while back, but can’t recall their names. Maybe she will stop by. Robin Cook of course if you want to go medical. (And Michael Palmer, who has kind of taken on his mantle, though Cook is still writing as a shadow of his former self). Dark Matter by Julie Zeh is about scientists but is not really scientific per se, though she plays with scientific concepts in the writing (mainly duality). Will that do 😉 ? I’ll probably think of others the minute I press “post comment”. I haven’t read The Swarm by Frank Schatzing but it is well regarded – even got a sort-of review in Nature. http://en.wikipedia.org/wiki/The_Swarm_(novel) Not sure if it counts as thriller or sci fi. OK I’ll go away now. I had forgotten Miss Smilla but you’re right that one would fit right in. Some other good ones to look for here too so thanks very much for populating my personal wishlist. I think you sold me on Alex Brett if I can find this book. Total Eclipse, Intuition and Dinosaur Feather sound good and worth my searching for. I loved Smilla’s Sense of Snow (U.S. title), except for the last 1/4, which I thought went off the deep end into thriller craziness. There is a U.S. writer, Sarah Andrews, who writes about a geologist, Em Hansen. Her books are full of information in the geology field. And I would say, though it could be stretching this category, that Fred Vargas, in Have Mercy on Us All, gives information on the history of bubonic plague in Europe. It’s all done in her quirky way. She is a medieval historian and archaeologist, and specializes in the bubonic plague. Coincidentally, I believe the topic of bubonic plague came up elsewhere as a reason to take off from work to read. Sounds like a plan if one can feign this realistically, without actually getting this disease — bad idea. Bubonic plague on a “sick note” would make them sit up, true! Sorry, me again – just remembered The Curious Incident of the Dog in the Night-Time by Mark Haddon. I recall you aren’t keen on reading this book, Bernadette, but I liked it a lot, has science eg chaos theory/maths (eg the chapter numbering). Thanks for all the reading lists. One big mystery – cannot find anything on Alex Brett – I loved her two mysteries! After 2009, where did she go and what is she writing? I don’t know what happened to her Sharon – I hate it when an author you like just drops off the radar.